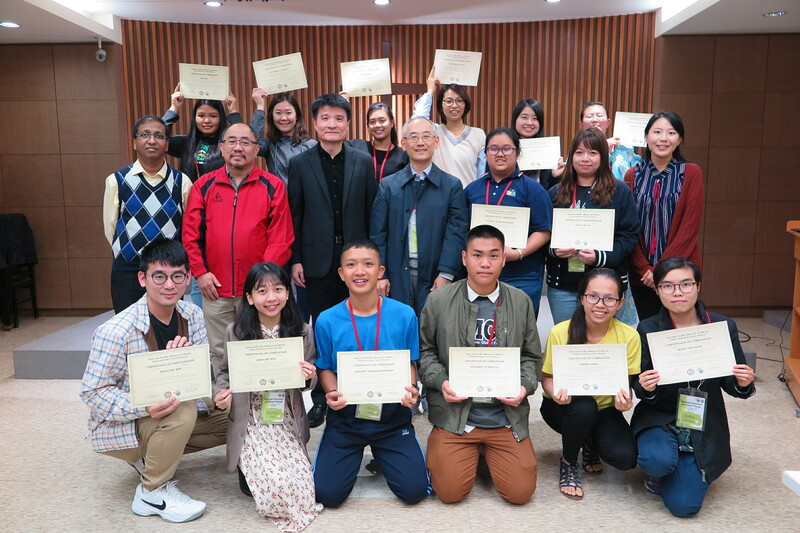 The APAY 3rd Regional Conference on Climate Change was held on January 17-22, 2019 at Taipei, Taiwan. Fourteen youth who completed the e-learning courses were invited to the conference. The youth were from Cambodia, Hong Kong, Mongolia, Myanmar, Thailand and Taiwan. The Regional Conference on Climate Change was the final and concluding activity of APAY E-learning on Climate Change program which stretched over a 10 month period. At this climate change conference, APAY also provided additional information and resources on issues related to combating climate change that is not covered by the e-learning. Participants also had opportunity to exchange information and experiences related to combating climate change by their local communities and YMCAs. And as the final part of the conference, all participants presented their Action Plans for combating climate change to show practical application of the knowledge gained from the e-learning. The conference opened with the welcome greetings and congratulations for completing all e-learning courses by James Tou, National General Secretary of Taiwan/General Secretary of Taipei YMCA and Nam Boo Won, General Secretary of APAY. In the first input session, Hsiao-Fen LAI from Homemakers United Foundation shared what the woman member-based organizations were doing to build an environment-friendly and green society, especially on food security through seed protection and low carbon food consumption. The remarkable thing about this organization their ability to deal with a very compicated concepts about food security and many kinds of environmental issues and then simplifying them into simple and practical approachs for local communities. Following the session, Dr. Shi-Ping, LIU shared about water and food issues of Taiwan society. As a health concern, he encouraged us to avoid using plastic bottles. Sessions in the second day followed a more practical approach where Beng Seng, GATN coordinator of APAY, shared the importance of being aware of our water footprint. In the next session, Duncan, Executive Secretary of APAY, worked with the participatants to calculate their carbon footprints. Through these two session, participants learned about how much activities in our daily life are contributing to global warming through CO2 emissions. As a wrap-up session, participants discussed deeply about how climate change issues are related to their daily lives and how to bring these big concepts of climate change issues to simple practical applications and actions. 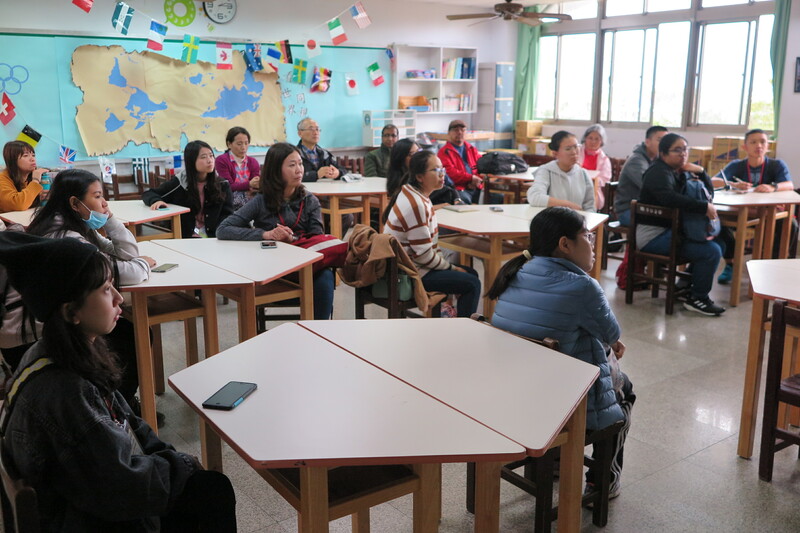 In the exposure trip to Hualien area, we visited ‘Stella Maris Ursuline High School’ to learn about how the local school is teaching environment-friendly living to all its students using the theme “About, In, For Environment”. The dedication of the school teachers have motivated the students to become interested in environment issues and participate in environment projects. 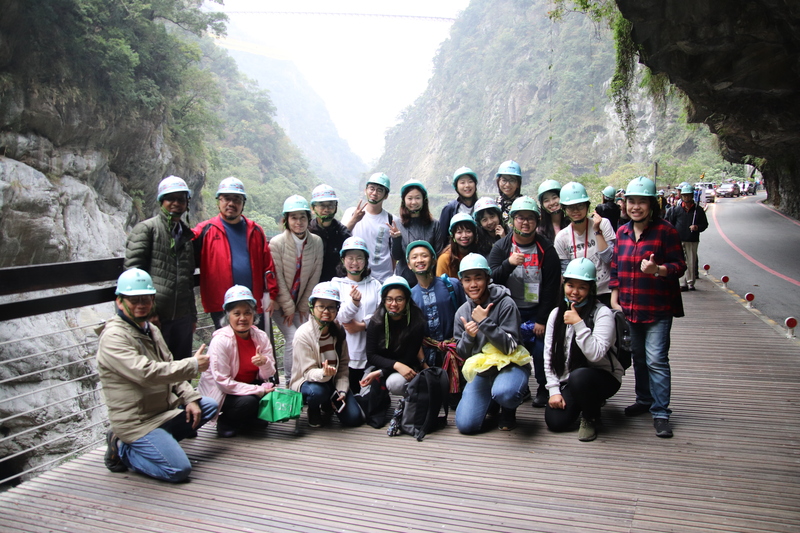 After the school visit, participants visited the Taroko National Park and hiked in the mountains to fully enjoy the fabulous beauty of nature. On the last day, as a final course requirement of the e-learning program, each participant shared their Action Plans on combating climate change in their local communities. The Action Plans focused on small and practical actions to combat climate change in their local contexts. It was a good way for them to link their 10 months e-learning on climate change issues to local actions. The Regional Conference of Climate Change was a good wrap up and conclusion to the e-learning course for participants. Hopefully, this conference will not be the end of their learning but would become a start point for their commitment to combat climate change issues in their local communities. The ongoing task for APAY is to promote climate change awareness among our local YMCAs. We hope these e-learners, trained by APAY, can be leaders and resource persons in their local YMCAs. 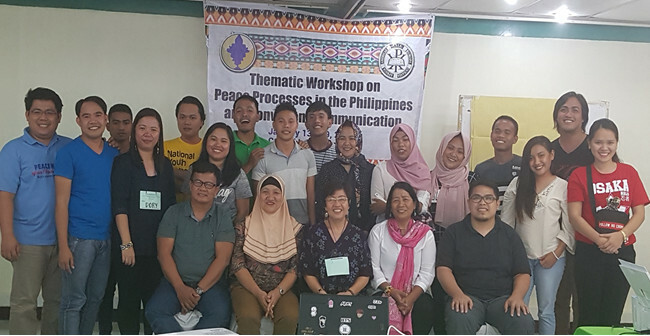 The Tri-People Thematic Workshop on Peace Processes and Nonviolent Communication was held on January 13-19, 2019 in Iligan City, Lanao del Norte, Philippines. Sixteen participants – Christians, Muslims and Lumad came from Luzon, Visayas and Mindanao. ICF Coordinator Muriel Orevillo-Montenegro facilitated the discussion on Understanding the Roots of YMCA, its Mission and the Role of APAY and ICF. Ofel Cantor, Program Officer of the Philippine Ecumenical Peace Platform (PEPP) presented The Nodal Points and Gains of the stalled GRP-NDFP Peace Talks, and Tirmizy Abdullah, a faculty member of Mindanao State University and an alumnus of School of Peace led the discussion on Bangsamoro History and Bangsamoro Organic Law. Amina and Nathaniel Mambuay facilitated the workshop on Nonviolent Communication. Providing leadership in team building activities and closing ritual were SoP alumni Baidido Saganding and Mohaimen Arba, along with Dunhill Maraya and Eugene Jamandron. Orevillo-Montenegro called on the participants, especially the YMCA youth, to study the history and mission-oriented roots of YMCA, and the World Alliance mission statement from Paris Basis, the Kampala Principles in 1973 and the imperatives enshrined in Challenge 21 of 1998. 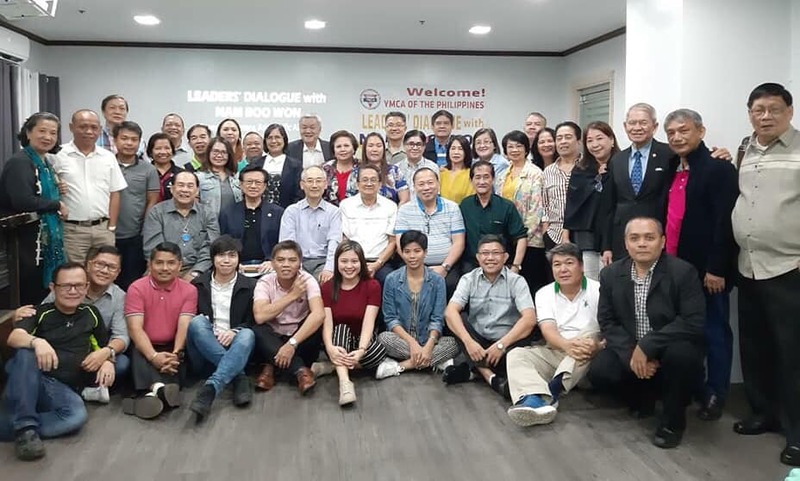 The youth, who will be the next generation of YMCA leaders and others must be mindful of these imperatives to keep on track of the YMCA direction. Even as the peace talks between the Government of the Philippines (GRP) and the National Democratic Front of the Philippines (NDFP) is stalled, a Filipino must know the importance of the talks. Cantor, program officer of the Philippine Ecumenical Peace Platform (PEPP) presented the nodal points, highlighting the gains of the peace process. The participants read the agreements between both GRP and NDFP peace panels, and discussed their essence. At the end of the day, the participants saw the need and urgency of calling both parties to resume the peace talks. Nonviolent Communication (NVC) was also well-received topic by the participants. The Mambuay Team encouraged the participants to learn and practice a way of communicating that does not do violence to both self and others. The participants were urged then to distinguish and learn to express their observations, feelings, needs and request. 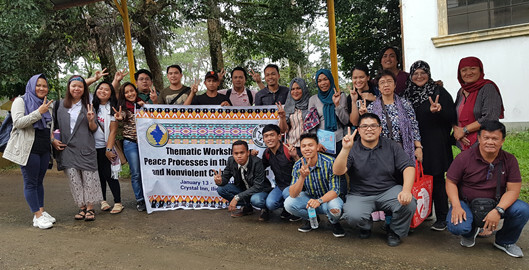 The participants recognized that NVC is much needed not just in the peace processes and social discourses, but also basically in relationships at home, and in the workplace. 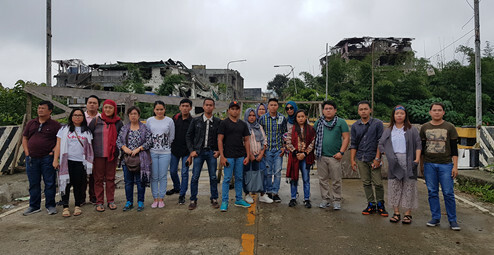 On Day four, the group travelled to Marawi City. The group visited the temporary shelter areas, traversed the roads of Marawi and saw the devastation of the once-a-beautiful-city. There, they listened to accounts of people who witnessed the siege of Marawi. The participants listened and interacted specifically with the youngest female village leader (Barangay Captain), who told her story as an internally displaced person (IDP). She echoed her people’s longing to go back to their homes in Ground Zero. The group also visited the Aga Khan Museum of Islamic Arts inside the Marawi State University. The reflection session was so heavy with emotions, literally. A participant recalled her harrowing experience of finding ways to escape during the siege of Marawi, refusing to leave behind her fellow Muslim and Christian classmates. Others shared that unlike the people of Marawi who are not allowed to go back to rebuild their homes and lives, their experiences of being displaced as evacuees (bakwit) were shorter as they were able come home after some time. How long will the bakwits languished in temporary shelters that are congested, without water and without livelihood activities? 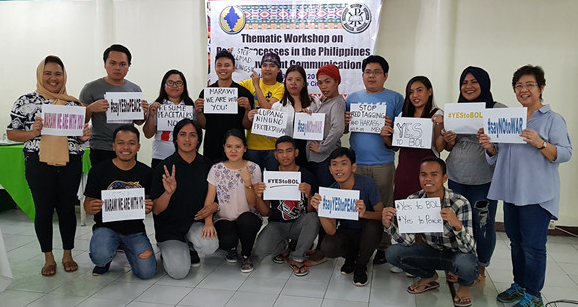 The five-day workshop ended with a ritual, where the participants expressed commitment to work for peace and unity among peoples – Muslims, Christians and Lumads. Post-workshop visits to significant places were done: the Maria Cristina Falls, a waterfall of Agus River, and whose power is harnessed to provide electricity to the whole island of Mindanao; Dansalan College extension in Iligan, whose main campus in Marawi that offered education to both Muslims and Christians, was burned down, and the place that used to be a “barter trade” market. 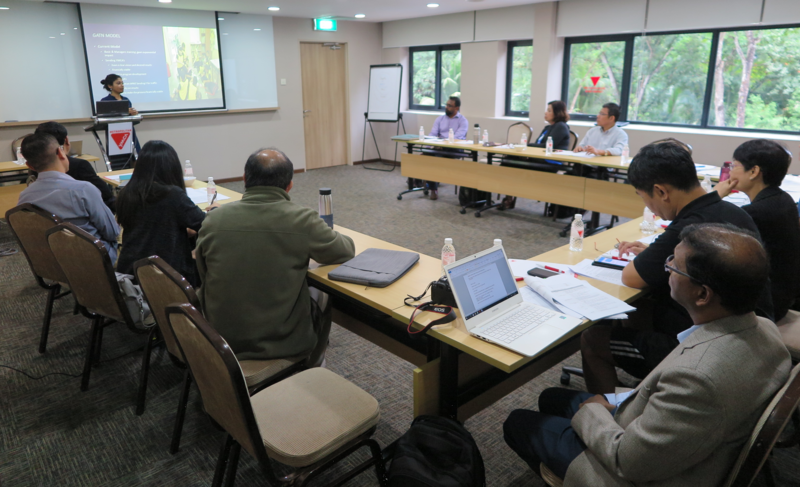 The Asia and Pacific Alliance of YMCAs (APAY) held its GATN Task Force and Mentors Meeting on 10-13 December, 2018 at Metropolitan YMCA, Singapore where task force members and mentors from Australia, Cambodia, Korea, Thailand, Philippines, Singapore, and Taiwan gathered to share information and discuss the Alternative Tourism programs of the YMCA. 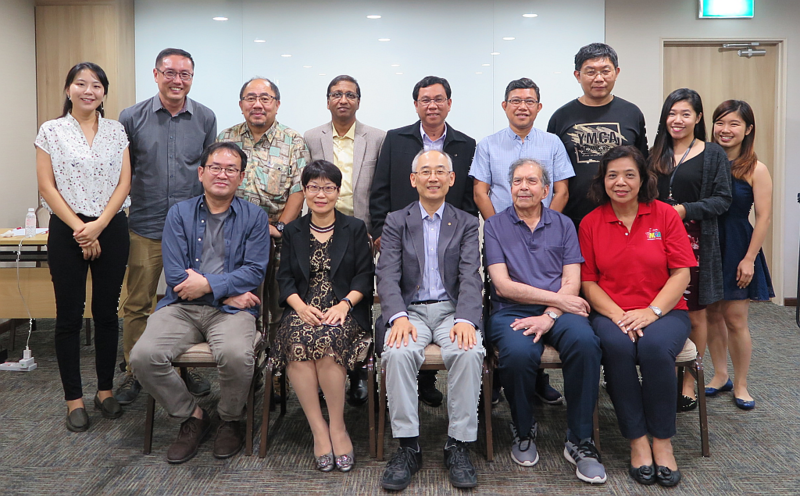 The meeting was hosted by the Metropolitan YMCA of Singapore. Our delegation was warmly welcomed by Phyllis Tan CEO of Metropolitan YMCA and NGS of Singapore YMCA. The Task Force and Mentors Meeting is an annual meeting conducted to discuss policy-level review and initiatives for the GATN programs. Members of the GATN Task Force also evaluated the work of GATN in the last year based on the programs conducted by the APAY and the results of the survey conducted among the receiving and the sending YMCAs. In the whole month of October, the evaluators had traveled to and visited the following GATN sites: Sri Lanka NCY, Moratua, Phnom Penh, Pangasinan, Penang, Kedah and Kuala Lumpur. The evaluation team also had a two-day focus group interviews in Kuala Lumpur with sending YMCAs from Taichung and Singapore. Finally, the evaluators conducted a Skype interview with the Uni-Y staff of the HK Chinese YMCA and APAY Executive Secretary, Duncan Chowdhury. During the site visits, they will have interviews with the different stake holders related to our GATN activities and assess the impact of our GATN activities on local communities as well as on the young people who participated in the GATN activities. 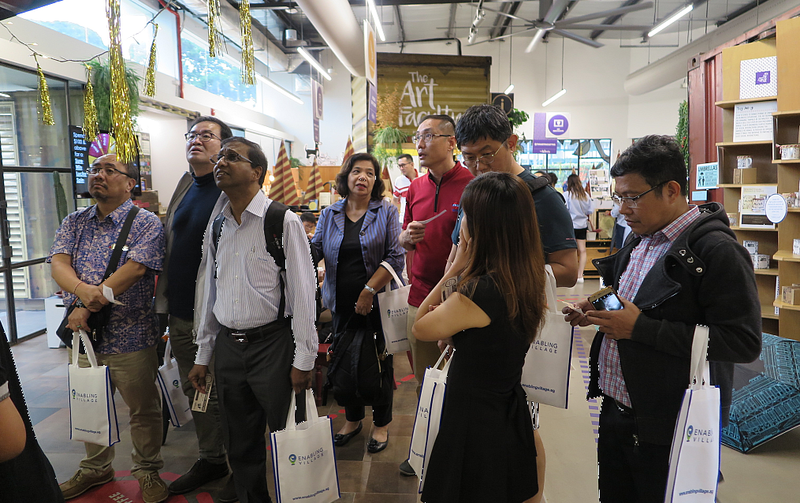 During the Task Force meeting, YMCA of Singapore organised an exposure visit to the Enabling Village – a community and a space that combines retail, lifestyle and training for disabled members of the community in an all-accessible public space. The visit was very educational and provided many ideas and examples for local YMCA work. A Partners Support Group (PSG) meeting for Cambodia YMCA was held on 9th to 10th December 2018 in Phnom Penh and Siem Reap, Cambodia. The meeting was attended by PSG members: Mr. Gary Cox, General Secretary of Nelson YMCA, New Zealand; Mr. Kazuki Yamane, International Secretary, YMCA of Japan; and Mr. Nam Boo-Won, General Secretary, APAY. From Cambodia YMCA, the meeting was participated at by Mr. Libounna Ok, President and eight staffs headed by Mr. Bunthok Deth, GS of Cambodia YMCA. Apologies came from Mr. Steve Loh, GS, YMCA of Singapore (PSG), Ms. Ayako Takamura, International Secretary, Yokoyama YMCA (PSG) and Ms. Thelma P. Juntereal, Movement Strengthening (MS) Coordinator of APAY. On 8th December prior to the PSG meeting, Mr. Nam was invited to speak on the role and current activities of APAY to the participants of the Regional Director Elects (RDEs) of both Asia Pacific Area and Korea Area of Y’s Men International with a view to deepening the mutual understanding of the two like-minded organizations – YMCA and Y’s Men - for better partnership building. On that evening, a historical Charter Night to inaugurate the Phnom Penh Y Service Club – the first Y’s Men club in Cambodia - was celebrated by many Y’s Men leaders of both Areas & Y’s Men International, and Cambodia YMCA PSG members as well. The PSG meeting started with Sunday Worship where Pastor Ly Kim Chhay conducted a biblical reflection. This was followed by welcome remarks by President Libounna Ok. He appreciated PSG members joining in the meeting coming from far away; emphasized the need to strengthen YMCA HR policy; shared difficulties in financial management, etc. He expressed his expectation on the partnership development with Cambodia Y’s Men in the coming future. APAY GS Nam also made his welcome remarks. He reiterated the purpose of the PSG meeting to help strengthen Cambodia YMCA as a healthy and relevant faith-based social movement. The meeting listened to the various program reports conducted in 2018 by the staffs-in-charge: YMCA Learning Center (YLC) reported by Ms. Sambath Virey; Youth Institute reported by Ms. Rin Nimey; Siem Reap Childcare program reported by Ms. Leng Dalin; Alternative Tourism (AT) reported by Mr. Hem Thel; and Old People Project reported by Mr. Som Chea. Thereafter, discussions followed on each of the programs with suggestions for future improvement and innovation of them. Following the program reports, financial report was made by Ms. Chhom Sochy. There was a request from PSG that all the donor income should be reviewed in a total picture, including from other funding sources. In the discussion on 2019 program & budget plans, the following reports and comments were made: Old People Project will continue with Oxfam funding, targeting elderly people with age of 60+ in 3 communities. The project will engage youth as volunteers in forming Old People’s Association, along with education on advocacy skills. Youth Institute (YI) is trying to organize Girls and Boys Club as active membership. Regarding Alternative Tourism (AT), there was a suggestion to start an outbound tour operation service in addition to receiving alternative tour groups. 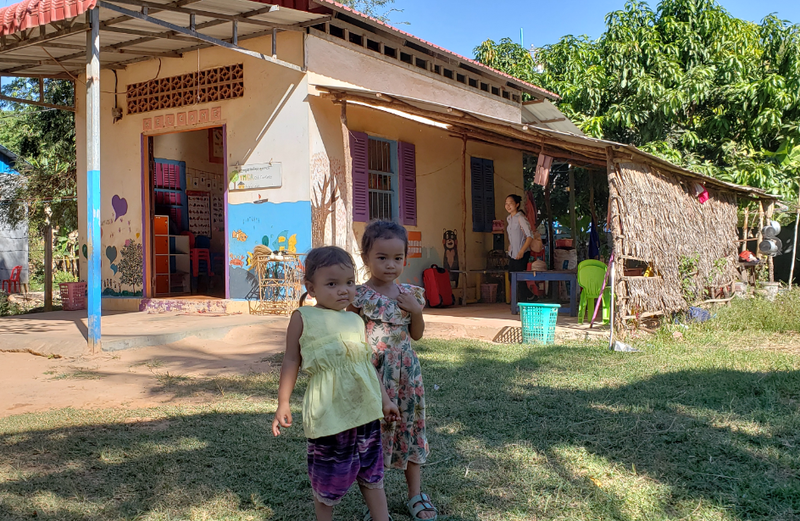 The Siem Reap Childcare Center needed one more building as the present facility does not have enough classrooms to accommodate children who want to come to the center. There is also need to separate the existing class into 2 classes. After reviewing the 2019 program plan and budget proposed by Cambodia YMCA, PSG adjusted the total budget within the capacity of the PSG members including designated fund and probable project applications by Cambodia YMCA. At the closure of the meeting, President Libounna Ok expressed his deep thanks to all the PSG members for their solidarity and support for the development of Cambodia YMCA. GS Nam, on behalf of APAY, also conveyed his gratitude to PSG members, and encouraged all the staff to keep up their good work in 2019 too. 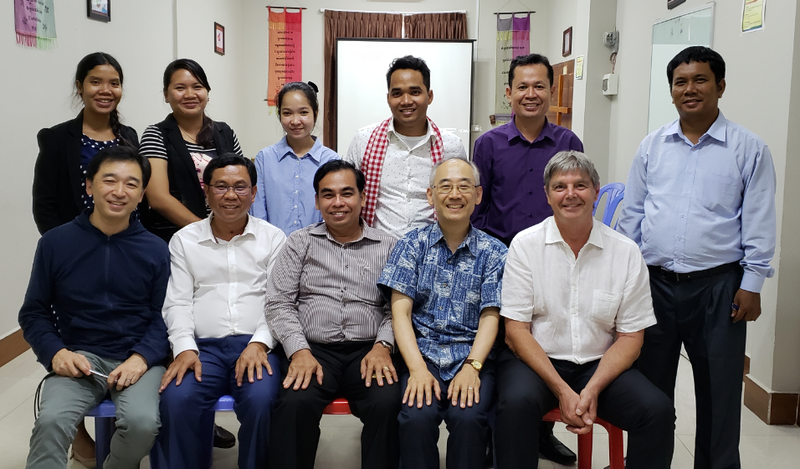 Mr. Gary Cox, GS of Nelson YMCA and Kazuki Yamane, International Secretary of Japan YMCA, also expressed their expectation for Cambodia YMCA to grow more firmly in its institutional management and program developments in the years to come. Next day on 10th December, the PSG members, along with Cambodia YMCA staffs, paid a visit to the Childcare Center in Siem Reap and surrounding poor villages. While appreciating the meaningful work of the Childcare Center, the PSG members also discussed on how to sustain the Center so as to better serve those impoverished villagers for their self-sustenance as well as their children’s better quality education through the center. 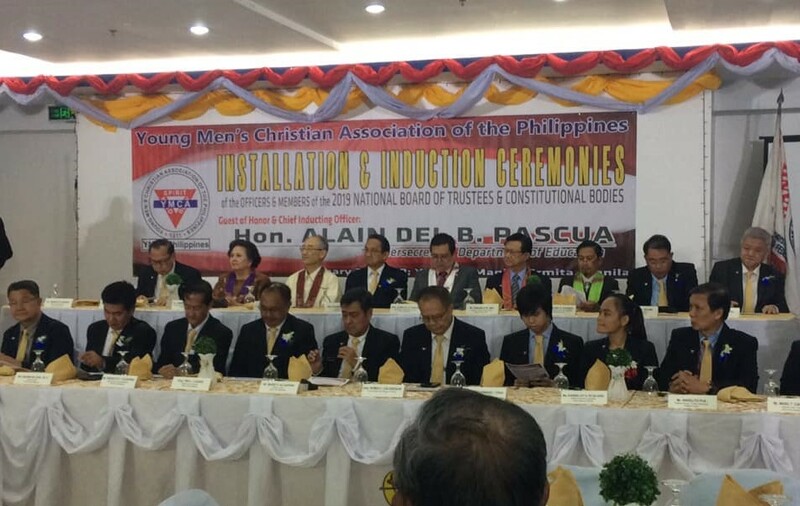 An Installation & Induction Ceremonies of the Officers & Members of the 2019 National Board of Trustees & Constitutional Bodies were held in Manila YMCA on 26th January 2019 at the start of new year for the YMCA movement in the Philippines. 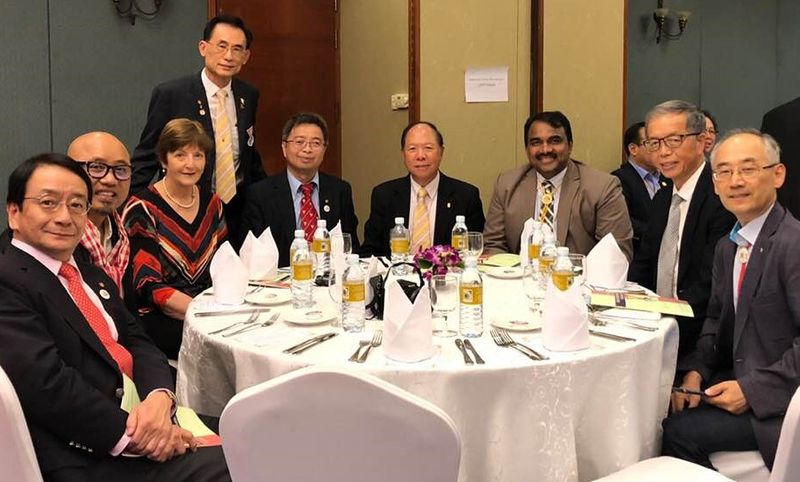 Mr. Nam Boo-Won, General Secretary of Asia and Pacific Alliance of YMCAs (APAY), was invited to the occasion as First Inducting officer, along with Hon. Alain Del B. Pascua, Undersecretary, Department of Education as Chief Inducting Officer; Mr. Edward K.W. Ong, ISD/ASD, Y’s Men International as Second Inducting Officer; Dra. Ramona UJ Morales, Past National President, Y-Phil as Third Inducting Offier; and Mr. Felix Eliral R. Refuerzo, Past National President, Y-Phil as Fourth Inducting Officer. 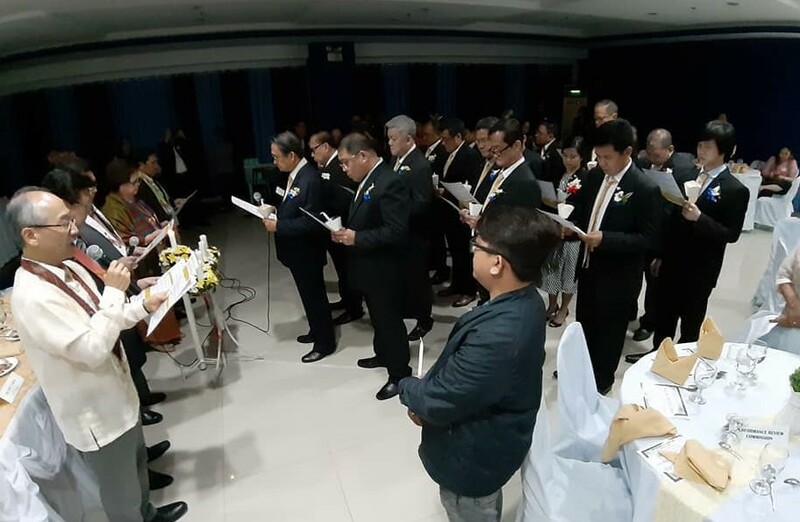 The Ceremonies, attended by more than one hundred participants from different regions of the country, were conducted in a solemn and celebrative way enough to inspire the voluntary commitment of all the inductees. Prior to the installation ceremony, there was a dialogue between the GS of APAY and National Board/local YMCA Presidents & General Secretaries with a view to strengthening working partnership between the Y-Phil including local YMCAs and APAY. 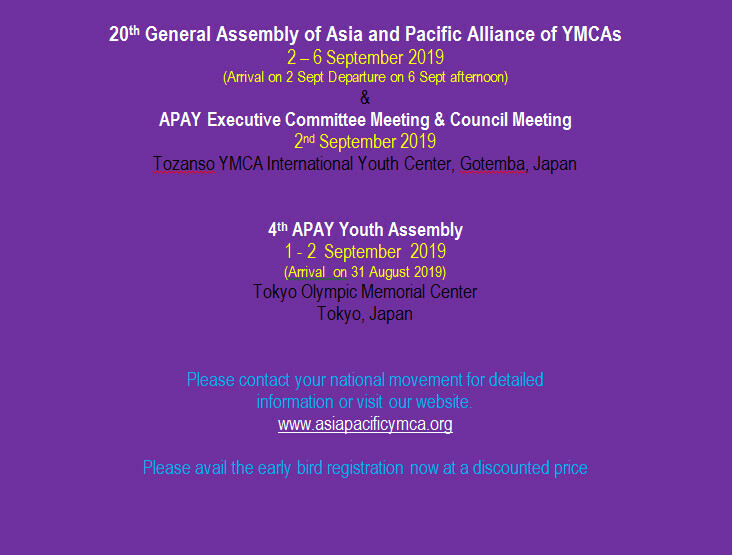 Nam made a presentation explaining the main activities and programs of APAY under the plan “Quadrennial Program Plan (QPP)”, as well as the mandate and role of the APAY as regional alliance vis a vis World Alliance of YMCAs (WAY) and national/local YMCAs. Thereafter, there were questions and answers as well as discussions on how YMCAs at different levels can work more effectively and collaboratively in “unity in diversity” to serve their communities and peoples, particularly the voiceless and marginalized as Jesus Christ had done and taught us through Bible. At the end of the dialogue, Nam reminded the participants that Y-Phil had a great history and potential to play a crucial role not only in the Philippine society but also in Asia at large towards the advancement of humanity in harmony with the whole creation. He hoped, being echoed by the participants that this is critical time for Y-Phil to unite again for unleashing the full potential of it to become more relevant faith-based social movement based on YMCA mission in context. The dialogue continued with a presentation on Y’s Men International’s history and current activities made by ISD Edward Ong from Singapore, seeking and promoting more collaborative partnership between YMCA and Y’s Men at all possible levels of the two like-minded & roots-sharing organizations. The APAY wishes to express its gratitude to President Atty. Eduardo P. Pilapil and NGS Pablito A. Tabucol for their kind invitation extended to GS Nam as well as providing a good opportunity to share APAY’s work with the lay & professional leaders of the Y-Phil. This year YMCA embarks on a new chapter of our history as we celebrate 175 years of service to young people and their communities. Over these many years, countless men and women have tirelessly given their time to advance our movement. 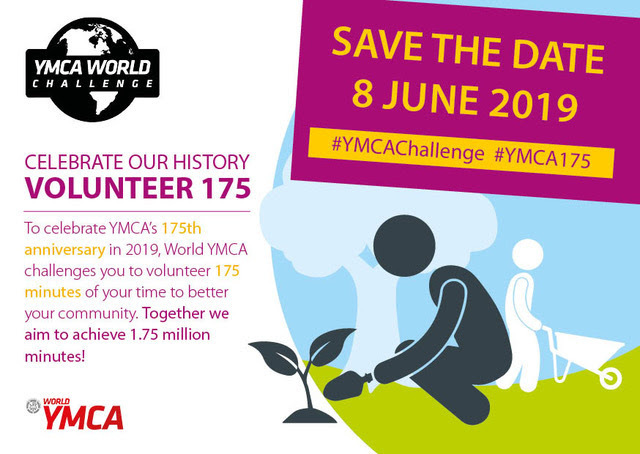 For this year’s World Challenge, we honor those efforts and call upon the citizens of the world to volunteer 175 minutes of their time for the betterment of their community on Saturday 8 June. YMCAs will be encouraged to host events focused on volunteerism while also encouraging others outside the movement to participate on their own using the #YMCAChallenge. With your support we aim to achieve 1.75 million minutes volunteered on the day. To help local YMCAs promote their events, World YMCA will be providing support with materials including social media graphics, flyers, posters, videos and more. Contact your national movement for further details. Mr. William Fu from the YMCA of Hong Kong has been elected as the President of the Council of YMCAs of Hong Kong at the Annual General Meeting held on 21st January 2019 for the next tenure. Mr. Fu joined the YMCA in 1965 and volunteered as Ballroom Dancing Instructor in 1968. He was the Charter President of Ballroom Dancing Club of the YMCA of Hong Kong in 1981. Then he joined as a member of the Board of Directors of YMCA of Hong Kong in 1983. In 1990 he was honored to be the first Chinese President of YMCA of Hong Kong and on the same year he was elected as the President of the Council of YMCAs Hong Kong and also served as Council President on several other occasions. Mr. Fu is a Charter Member of The Y’s Men’s Club of Tsim Sha Tsui and currently serves as the Chairman of Hostel Services Committee of YMCA of Hong Kong. APAY congratulates Mr. Fu for being elected as the President of the Council of YMCAs of Hong Kong.